The MiWER Centre is one of the few international research organisations with a focus on the ecology of mine-pit lakes. We are also interested in all inland aquatic systems, with projects evaluating constructed wetlands for nutrient/metal stripping, bioremediation of acid mine drainage and acid sulphate soils, urban wetland management (eutrophication, rehabilitation, nuisance midges), as well as riverine ecology. We work with industry, local and state government, consulting companies, community groups, and other research organisations. Associate Professor Mark Lund (MiWER Principal) first started working on pit lakes in the coal mining area of Collie (Western Australia) in 1995. In 1998, Mark joined with collaborators from industry, government and academia on the Australian Coal Research Program project ‘Final void water quality enhancement’. Mark is a founding member of the Western Australian State Government Centre of Excellence in Sustainable Mine Lakes (CSML, 2002 to 2006). In 2008, Dr C.D. McCullough and Mark formed MiWER at Edith Cowan University in the School of Natural Sciences (now School of Science). The research centre is a formally-recognised level-one research group at the University. 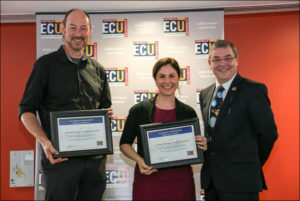 MiWER is also a member of the Centre for Ecosystem Management at Edith Cowan University – a level two research centre. MiWER’s aim is to further understanding of freshwater science using creative, cutting-edge technology for improving resource sustainability and environmental condition. We focus on both applied & theoretical research. We are available for consultancies in areas of our expertise. We endeavour to assist community groups, not-for-profit organisations and NGOs where possible.